In the El Paso Times recently, the paper reported on a petition by the Texas Education Agency to revoke the certifications of 11 educators accused of being part of a cheating scandal. According to the paper, “[t[he petition accuses most of the respondents of participating in a scheme to falsify federal accountability reports, or knowing of the scheme but doing nothing to stop it.” (Full report here). Federal accountability reports can cover many things, but we know one thing it covers is the progress of schools, districts and the state in meeting the No Child Left Behind Act’s requirements that every school make Adequate Yearly Progress (AYP). As we explained in our article on Data Manipulation, absences on test days hurt districts more than failed assessments because of the formula for calculating AYP. The TEA is engaged in a scheme to distort the number of students actually assessed by the STAAR exam. 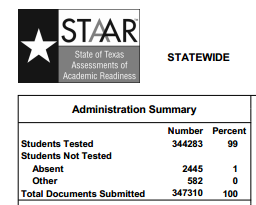 People may disagree about the STAAR testing system, but one thing we can all agree on is that a student who does not take the test has not been tested. They have not been assessed. No data has been captured with which any assessment of academic readiness could possibly be made. This is true whether the student is sick or present but refuses to be tested. Any action resulting in a report that claims a student that refuses the test has actually been tested is misleading, if not overtly false. Yet that is precisely the system that the TEA not only tolerates, but insists that districts implement. 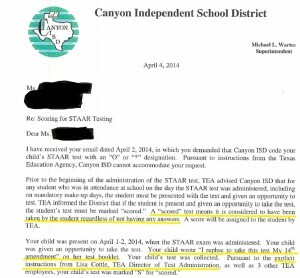 According to Canyon ISD, this directive comes directly from the TEA’s Director of Test Administration. Yet nobody from the TEA is being investigated or threatened with having their education certificates revoked. Now this may appear innocuous on its face. Assigning a zero for not taking a test would be a common tactic in the classroom. However, with an assessment designed to meet federal accountability standards, the effect goes beyond the score report placed in the student’s file. It turns into a representation to the federal government and the taxpayers of Texas that the student has actually been assessed. The student, by Canyon ISD’s own admission, refused to be assessed. She was not tested in any way. But consider this data box from the statewide summary report generated by the TEA.